Tennis anyone!?!? A fantastic desert getaway! A great condo with terrific south facing views! The condo itself has a very nice floorplan, is well appointed with all the comforts of home plus it's very clean. The owners (Cory & Neal) are easy to deal with. They are prompt to respond to any questions you might have during your stay! Try the Palm Desert Tennis Camp which is located within the resort itself. The staff at the tennis facility are second to none plus the people you meet at the tennis mixer are super friendly! Wish I could have stayed longer. Oh almost forgot the salt water pool and Jacuzzi are a few short steps away from this condo. Thanks again to the hosts/owners (Cory & Neal)... I can't wait to get back!!! This place is in great shape and tastefully furnished and decorated. Both bedrooms were very large, each with a bathroom. The kitchen overlooked the spacious dining/living room area so you could check on dinner without missing out on the conversation. The patio was perfect for breakfast with an awesome view, just as advertised in the photos. Internet work very well and free long distance on the land line was a nice perk. The resort staff at the gate were friendly and efficient and the hosts Cory and Neal were happy to take care of every request we had, even providing direction to local shops and best routes to various site seeing locations. The golf course and the grassy walking paths are very well maintained and the pools, hot tubs and pool areas are very clean. The kitchen was well stocked for preparing and serving your own meals, and there is also lots of grocery stores and dining out options just minutes away by car. Great overall location and a nice place to call home for an extended stay. Thanks so much for the fantastic review! You are welcome back any time! A Comfortable & Scenic Place to Relax! We have vacationed at this condo for several years in a row now and we always enjoy our time there. Cory and Neal are continually upgrading things and each year we look forward to seeing what changes have been made. They are easy to deal with and provide all the information you need to find and access the unit on arrival. Everything in the unit is just as it is described in the listing. Their pride of ownership is evident. The unit is clean, comfortable and equipped with everything you need to settle in quickly and start enjoying your vacation. The floor plan is perfect for two couples to share and still have plenty of space and privacy. Should any unforeseen issue arise, they are quick to respond and easy to work with, to resolve it quickly. The view of the golf course from the patio is fabulous! We think it is one of the best views in the resort. We found both sun and shade on the patio at any time of day, providing a relaxing place to sit and watch the ducks playing in the ponds, or the golfers playing through. The nearest community pool and spa are only steps away from the front door. The salt water pool is heated and there are lots of lounge chairs available. 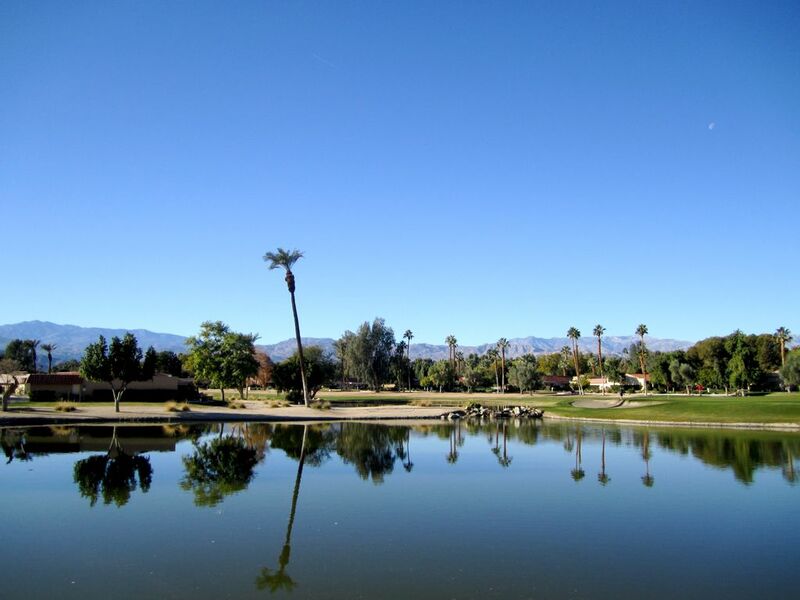 The Palm Desert Resort & Country Club is safe, friendly, scenic and well maintained. The central location in the valley provides for easy access to major shopping areas and tourist attractions. Thank you for your wonderful review! We really appreciate it! We are always happy to rent our condo to you and feel that you treat our desert home as if it was your own. Rates are subject to change until booking is confirmed. Air Conditioning surcharge is applicable during summer season.